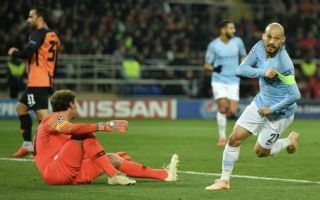 Manchester City are two goals to the good in Ukraine in the Champions League on Tuesday night thanks to David Silva and Aymeric Laporte. The Citizen’s took the lead after 30 minutes thanks to their Spanish playmaker, who slammed home a volley with perfect technique after Shakhtar Donetsk failed to clear their lines. Pep Guardiola’s men kept the pressure on thereafter and were rewarded with another goal just five minutes later when Laporte rose highest to meet a Kevin De Bruyne corner. The Premier League champions will be expected to go on and secure an important three points in Group F, to move onto six points after three matches played. Follow for all goals on time ? ?